The U.S. Preventive Services Task Force has released new draft recommendations saying that physicians should screen pregnant women and new moms to identify those who are at risk of becoming depressed, so they can be treated before they show symptoms and a diagnosis of depression can be averted. The recommendations say physicians should look for these risk factors: a history of depression, current depressive symptoms (like sadness, hopelessness about the future, lack of sleep, etc. ), and socioeconomic risk factors like being low income, very young or a single parent. "We do know that women who've had depression before or have family members who have depression or who currently have elevated symptoms are at risk," says Karina Davidson, a professor of medicine and psychiatry at the Columbia University Medical Center, and a volunteer member of the task force. "We also know that there are [other] risk factors for developing depression, like a history of abuse or recent life stress or extreme social isolation, as well as a number of others that a physician should be thinking about when they're meeting with a patient to decide whether this person may be at an increased risk for developing depression." The risk of developing depression is high — about 1 in 7 pregnant women and new mothers suffers from depression during pregnancy or in the year after childbirth. And for some groups of women, the rate is even higher. "There's subpopulations of women, like adolescents, women veterans and women of socioeconomically disadvantaged status, where the rates are as high as 1 in 3," says Tiffany Moore Simas, an associate professor of obstetrics and gynecology at the University of Massachusetts Medical School. "So it's really extraordinarily common." In 2016, the task force recommended that physicians screen women for perinatal depression — depression in women during pregnancy and in the year after childbirth — and refer the depressed women to cognitive behavior therapy. American College of Obstetricians and Gynecologists also recommends screening pregnant women for depressive symptoms. For the new recommendations, Davidson and fellow members of the task force reviewed existing studies and found that two kinds of talk therapy — cognitive behavior therapy (CBT) and interpersonal therapy (IPT) — can prevent depression in at-risk women. "The really big news is that counseling to prevent depression in women who're at risk works," says Davidson. And "counseling doesn't cause increased anxiety, and it doesn't hurt in any way. So that we thought was good news." CBT works by changing a patient's thought patterns and behaviors, and IPT helps a patient improve relationships by helping them improve their communication skills, she says. "We saw depressive symptoms went down and the chances of developing depression went down if you received some of these counseling techniques." Maria Muzik, an associate professor of psychiatry at the University of Michigan, welcomes the new recommendations. 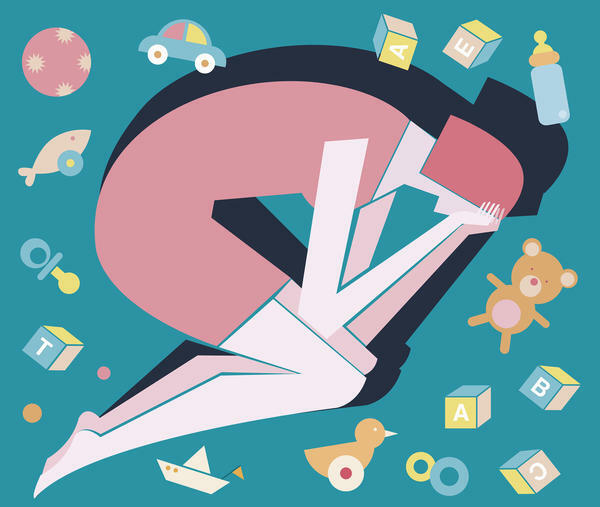 "We know that once you have manifest illness, it takes a good four to eight weeks to start recovering," says Muzik, who is the co-director of the Women and Infants Mental Health Program at the University of Michigan. "During this time, both the mother and the baby and the whole family system is impacted by the illness." Studies have shown that perinatal depression hurts not just the mother's health and well-being, but also her partner's and the child's. "If mom is depressed, she might not present to prenatal care, she might not eat well, she might not sleep well. All of this will have an impact on the pregnancy outcomes and the baby," notes Muzik. Perinatal depression has been associated with premature delivery and low birthweight babies. And studies have shown that postpartum depression is associated with cognitive delays in the child. "If we could get in earlier, and provide some treatments such as psychotherapies ... then we could prevent new onset of illness," adds Muzik. That, in turn, could prevent the whole host of negative effects on the child, the mom and the family. "I do think even better than treating perinatal depression is preventing perinatal depression," says Moore Simas, who was not involved in the new recommendations. However, she adds a note of caution. "I think what we will find is that there will be a struggle in getting women in in a timely way, and having women have true access to that type of care," she says. For one, "the availability of mental health professionals varies pretty widely across the country," says Moore Simas. Urban centers with many big health care systems typically have better access to mental health care. Then, there are OB-GYNs who have been reluctant to take on this task. But it's not because they don't want to screen, she says. "A screen is just a screen, it's not a diagnostic tool. You need to then assess the woman, get a sense of her severity, if she does in fact have depression, and then connect her with treatment," says Moore Simas. "Often, access to a psychiatrist is very, very limited. And OBs traditionally have not been trained in this type of complication." Massachusetts has already begun to address the issue. Moore Simas, who is based in Worcester, Mass., is the director of engagement for a program called Massachusetts Child Psychiatry Access Program for Moms. "That's a program where if I, as an OB, have a woman in my office who's struggling with an emotional health complication in pregnancy or frankly who comes into pregnancy already dealing with a mental health issue and I don't know how to deal with it, I'm able to pick up the phone, talk to a perinatal psychiatrist and having them help me figure out what the best way is to address her needs," says Moore Simas. "In addition to [it], we have a live active inventory of all the supports in the states around mental and behavioral health services." The program has led to a dramatic change among the state's physicians' willingness and ability to refer pregnant women and new moms to get treatment for depression, she says. In time, she hopes other states can also develop programs like this to address perinatal depression. Because "mental health complications of pregnancy is one of the most common complications for pregnancy," she says. So, any efforts to reduce the rates can make an impact, not just on mothers but also their children and families. Pregnancy and childbirth can be an emotional rollercoaster. Women can sometimes develop clinical depression lasting weeks or more. A federal advisory panel now says depression can be prevented if physicians can identify pregnant women and new mothers who are at high risk and help them get treatment. NPR's Rhitu Chatterjee reports. RHITU CHATTERJEE, BYLINE: Depression during pregnancy or soon after childbirth hurts not just the mother but also her child. If a pregnant woman is depressed, she's at a greater risk of delivering a premature baby. And when a new mom has depression, it affects her baby's development. Karina Davidson is a professor of medicine and psychiatry at Columbia University Medical Center and a member of the U.S. Preventive Services Task Force, which has just released its recommendations on perinatal depression. KARINA DAVIDSON: What we're interested in is preventing this illness. CHATTERJEE: The panel is asking physicians to screen women to identify those who are at high risk of becoming depressed before their symptoms turn into full-blown depression. The panel recommendations include a list of risk factors that physicians should look for in pregnant women and new moms. DAVIDSON: We do know that women who've had a depression before or who have family members who've had a depression or currently who have elevated symptoms are at risk. CHATTERJEE: The panel says that physicians should refer the at-risk women to counseling because it can prevent clinical depression. DAVIDSON: We think the really big news is that counseling to prevent depression in women who are at risk works. CHATTERJEE: The task force found evidence that two types of counseling, cognitive behavioral and interpersonal therapy, are the most effective ways to prevent depression in women. Tiffany Moore Simas is at the University of Massachusetts Medical School. She wasn't part of the panel but welcomes the new recommendations. That's because she says it's a common illness. TIFFANY MOORE SIMAS: One in 7 women on average will experience this complication. CHATTERJEE: She says OB-GYNs should be screening to identify and treat women who already have depression, but prevention would be even better than cure. However, she says physicians may find it difficult to follow what the panel is recommending because many feel ill-equipped to handle mental health care issues, and mental health care resources can be scarce in some parts of the country. She says Massachusetts has already tackled the problem by providing more support to doctors like a toll-free line that connects them to a psychiatrist. SIMAS: OB practices or any office that is caring for a pregnant or postpartum lactating woman can pick up the phone and say, I have a woman in my office. I'm worried about her. I don't know what to do. I want to talk to the perinatal psychiatrist. CHATTERJEE: She says such programs can make a big difference in helping doctors deal with this all-too-common illness that affects not just moms but their children and entire families. Rhitu Chatterjee, NPR News. (SOUNDBITE OF CAIRN STRING QUARTET'S "TUSK") Transcript provided by NPR, Copyright NPR.